It reminds me of why I love teaching. As I wrote in another blog entry years ago, sharing that aha! moment with the participant is priceless - that moment when their face lights up and you know they finally got it. That's all. Have a nice day! After the Christmas holidays, my mind automatically fast forwards to the lazy, sunny days of summer. 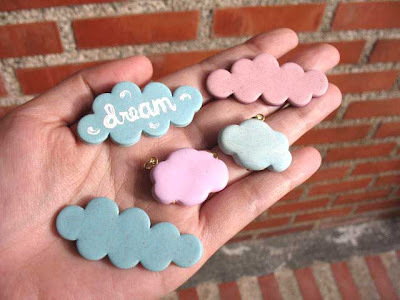 It's still a couple of months away, but I couldn't help making these cheerful polymer clay clouds. I've recently been to the beach. Last weekend, Marco and I attended our friends' brother's wedding in Laiya, Batangas. Actually, Marco was the designated wedding singer. haha. It was a dreamy beach-side event complete with white tents and lanterns. At the reception, we sat on banig mats and ate on dulang-like tables (low tables) as Marco serenaded us with his acoustic numbers. At midnight, the groom's family lit up fire balloons (is that what they're called?) and we watched them float to the sky as we sat on the beach. I feel so honored to be part of such a heartwarming event. I still have a bit of sunshine in my system, so I just had to make these this week. These clouds are simpler versions of the ones I made in '08, which featured a "silver lining" - dainty embroidery lining the fluffy edges of each cloud. I'll try to unearth photos of those old ones and post them here. Sigh. I can't stop dreaming of the beach. I think I finally got a name for the hearts-with-wings collection. I'm calling these "Hearts a-flurry!" Just like that lovey-dovey feeling you get on Valentine's day. I decided both "Angel heart" and "Wings of Love" are cliches. I hope when I wake up in the morning, the new name still sounds good. Lol! 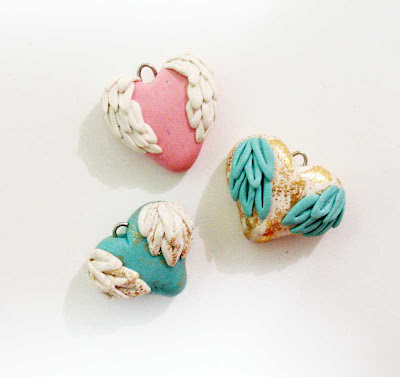 These lovely polymer clay hearts are fresh from my oven... just in time for February! I made seven pieces, all one of a kind. 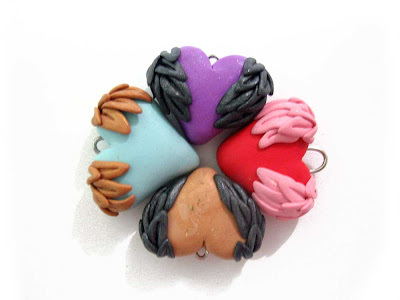 They're tinier versions of the heart collection I made a couple of years ago. A little under an inch tall, as you can see in the picture below. They remind me of the Snitch in Quidditch! The wings are inspired by Christi Friesen's work. (I adore her!) I put a little spin on it to make it my own. 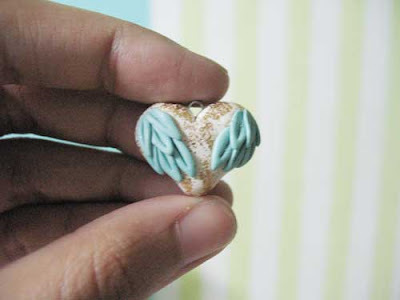 I still can't decide whether to call them "Angel Hearts" or "Wings of Love". What do you think? Here's our view from the terrace.